Welcome to the Hello! Annual Catalogue 2016-2017 Blog Hop! 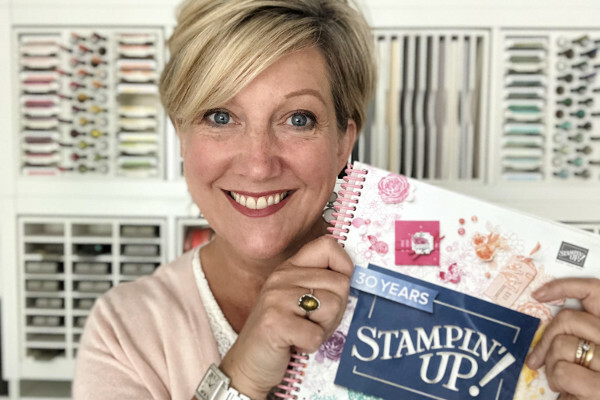 You’ll be hopping around some amazing Stampin’ Up!® Independent Demonstrators blogs, each with an inspirational project, featuring new catalogue products. Currently you’re visiting Michelle Last from the UK Hello there! You can continue hopping by using the previous and next buttons at the end of this post. Now, let’s scroll down to see what I’ve been making. I reached for my Blooms & Wishes set which is so easy to create beautiful cards. It looks so different when stamped in different colours too, see my previous card made with different colour inks! It is such a versatile set! 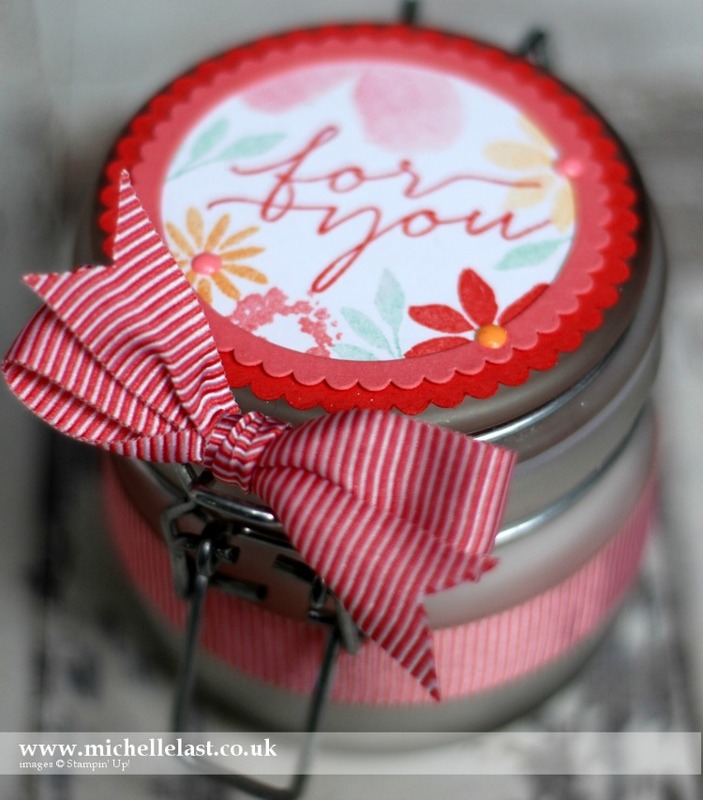 I had a little candle in a jar and decided to embellish the top to match the card to give as a gift and paired with the striped ribbon as it coordinates so well! I used the new layering circles framelits to create the double scallop edge. 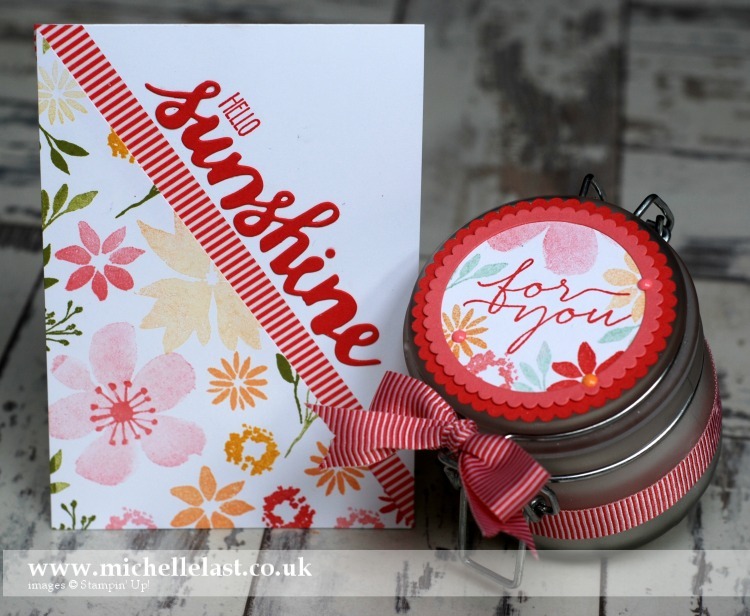 I also used the sunshine wishes thinlits to create the die cut sentiment and matching stamps from the Sunshine Sayings stamp set. I have a wonderful tutorial, video to share with you tomorrow on how I made the card and several others and you won’t want to miss it so be sure to pop back tomorrow! Don’t forget that the Bonus Days Offer is on which means that for every £45 you spend you will receive a coupon worth £4.50 to spend in August. More details on Bonus Days can be found by clicking the button on the right hand side bar. Thank you for visiting today. The next stop is the talented Louise Sharp from Australia. There’s lots of inspiration to be found in this group – and you don’t want to miss it! Michelle Last – UK < You are here! Here are the supplies I used to create this project, simply click the images below to go direct to my online shop. And for every £45 you spend you will receive an emailed coupon to use in August! And if ordering via my online shop don’t forget to use the monthly hostess code to receive a free thank you gift. Lovely, love the color and the composition of the card! Wow. This is stunning. Such a lovely idea to personalise the candle in a tin. I love the new framelits! Love the card and canule decoration. Love the card and candle decoration. your card and jar are awesome! They look like summer feeling! What a lovely color combo! Great that we’re back together at a blog hop! Do you have the conversion to inches for the one sheet wonder template? These are so cute. I would love to make them but I’m not good at converting from metric. Thanks. your card is beautiful; thank you for sharing. Love all of the crafts and would like to make some. How can I become a member?